It wasn’t so long ago that the telephone was considered the most important tool for business. 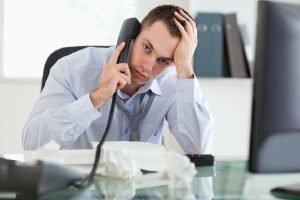 Although that honor has passed to the computer for many businesses, sometimes there’s no substitute for voice communication and a reliable business phone system to support it. Most businesses, especially small- and medium-sized businesses (SMBs), don’t give much thought to their phones after the initial setup—they just work, and as long as they do, it’s easy to take them for granted. Business phone systems do have their problems, however. Whether it’s poor management, outdated technology, or other issues, some systems suffer from poor reliability, high costs for maintenance and expansion, or other problems. As a result, some businesses have created a problem for themselves by not investing the attention and resources it deserves. Many businesses still rely on outdated analog private branch exchange (PBX) systems. Although they are usually reliable and feature good voice quality, managing them requires specialized, high-priced expertise. For SMBs, this usually means bringing in a contractor for tasks that should be simple, such as installing a new phone or rearranging extensions when people move from one office to another. Furthermore, keeping a PBX system means having two sets of wired infrastructure, one for the phones and one for the data network. Easy management: Adding extensions and external numbers can often be performed in-house using a simple web-based management tool. Most business VoIP providers can also manage these systems remotely and can perform management tasks while you’re on the phone with them—no need to wait for a technician to visit your site. Easy office moves: Office moves are easy because an extension is not permanently tied to a physical phone line; a user logs in to any phone in the system, and the phone immediately takes on that user’s assigned extension. Software integration: Some VoIP systems can integrate with communications software on each user’s computer, such as Microsoft Skype for Business, enabling users to initiate or answer voice calls from their computers. Mobile phone integration: Some VoIP systems have the capability to seamlessly transfer in-progress calls to a cell phone. If you’re in a call at your desk and need to leave the room for some reason, simply press a button on your desk phone…in a moment, your mobile rings, you answer, hang up the desk phone, and continue the call on your mobile, with the other party being none the wiser. Fax integration: VoIP systems can provide analog lines for fax machines without requiring a separate “plain old telephone system” (POTS) phone line to be installed. As businesses grow and expand, their phone systems can, without adequate management, become a patchwork of jury-rigged solutions, multiple POTS lines, poor or nonexistent documentation, phone jacks that are inaccurately labeled (or not labeled at all), and a rat’s nest of wires in the communications closet. This results in redundancies, fragile systems, and unreliable service. In addition, over time, solutions and phone lines might be purchased and then abandoned; many businesses pay the phone company high service fees each month for business POTS lines they aren’t using. This can be a significant expense that’s entirely unnecessary, but it goes unnoticed because no one is properly managing the system. Given that the phone system is so critical to a company’s ability to conduct business, it’s imperative that they dedicate the resources to ensure it’s set up and documented properly, managed effectively, and designed to accommodate future growth. This is true for both traditional and VoIP systems, but as mentioned previously, it is usually accomplished much more easily with a VoIP system. If your business has outgrown its phone system (or your ability to manage it), it’s worth your while to examine your current system and how much you’re paying for it, and look into alternatives such as VoIP. Many providers specialize in providing turnkey or managed VoIP systems for SMBs. The cost savings can be significant, especially considering the added quality, reliability, manageability, expandability, and features. The phone may not be the most important business technology anymore, but it’s still in the top two or three, and getting the right system should be a priority for any business.